VAN WERT – Van Wert High School’s Michaella Johnson was crowned Queen Jubilee XLIV on Friday during the Peony Pageant held at the Marsh Foundation Auditorium. Spencerville’s Torie Bockey was first runner-up while Crestview’s Chelsea Taylor was second runner-up. After the pageant, Johnson was overwhelmed with excitement. Johnson said she is happy that she took a chance and did the Peony Pageant. Her favorite part was the camaraderie with the other girls. She said she is looking forward to attending the Peony Festival and representing her school. Johnson said she encourages other girls to push their nerves aside and to do the Peony Pageant. 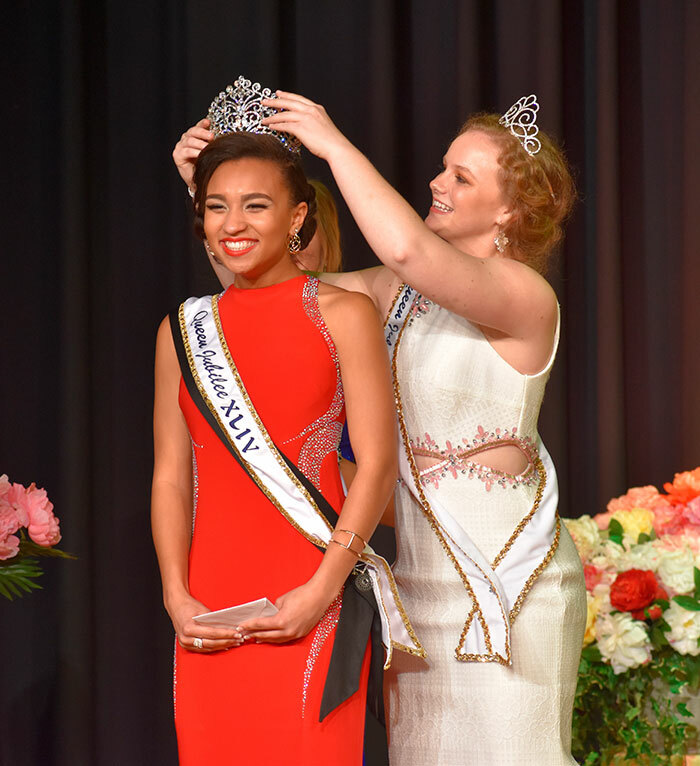 For winning the Queen Jubilee XLIV title, Johnson received a $1,200 scholarship, a $400 scholarship for winning the talent portion of the pageant and a $250 scholarship for winning the community involvement award. For winning first runner-up, Bockey received an $800 scholarship. For winning second runner-up, Taylor received a $600 scholarship. Other members of the court include Kylie Hohman of Lincolnview, Ashley Dauer of Vantage, Alli McClurg of Delphos Jefferson, Loren Stukey of Parkway, and Skye Stevenson of Delphos St. John’s. Little flower girls for the evening were Brynlee Balliet, Violet Menke, Bailey Stevenson, Jordyn Brown, Cece Rolfes, Quynn Arend, Kaylee Eickholt, Fiona Verhoff, and Hazel Giessler. Sean Ford was the Master of Ceremonies, Brody Mills was the crown bearer, Rick Sealscott was the pageant auditor, and Ron Allison controlled the lighting and sound. Pageant judges included Amy Bromberg, Brenda Burgy, Patrick Kamler, and Vaughn Roste. Preliminary judges included Connie Ainsworth, Stephanie Eding, and Pat Harris. The escorts/ushers for the evening were Jacob Hauenstein of Lincolnview, Austin Sheets of Crestview, and Jacob Trejo of Van Wert. This year’s Peony Festival will be held on June 7-9.